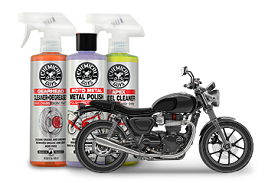 The Chemical Guys Leather Lovers’ Sample Kit covers every base to keep leather clean and soft, and free from cracking or greasy residues that ruin the look. New and well-maintained leather looks crisp and dry with a satiny matte sheen. Clean off body oils, dirt, and grime with Chemical Guys Leather Cleaner. 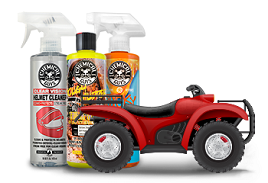 The colorless and odorless cleaner is gentle on leather, but tough on filth and oils. pH-balanced cleaning agents lift and separate dirt, oil, and filth from leather, pleather, and vinyl surfaces without drying out the material or leaving chalky white residues. 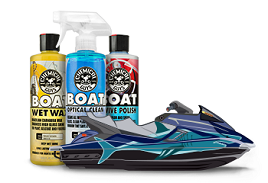 Leather Cleaner is safe to use on OEM and custom natural leather, King’s Ranch leather, durable sealed leather, and synthetic leather like vinyl and neoprene. Restore a soft and supple feel and rich color to leather pieces with Leather Conditioner. Leather Conditioner is like lotion for leather: nourishing and restoring lost nutrients for a soft and supple feel. Leather Conditioner restores a fresh satin appearance and soft and supple feel to leather by replacing lost nutrients like Vitamin E and Aloe. Specialty UV blockers help repel harsh sunlight and protect against cracking and fading. Nourish, protect, and restore leather with Chemical Guys Leather Conditioner so it lasts longer, and looks better for years to come. Chemical Guys Leather Scent is more than just an air freshener: it’s an odor eliminator. Leather Scent freshens any space with the distinct musk of freshly-tanned fine leather. Specialty enzymes destroy odor-causing agents to permanently stop odors at their source. Flush automobile AC systems with Leather Scent to replace foul mildew odors with fresh leather scent. Mist a few spritzes of Leather Scent in the car, truck, den, smoking room, clubhouse, or anywhere else a fine leather musk is desired.